Worshippers were comforted by the bishop’s Call to Grieve, in which he prayed that God would provide understanding that would relieve aching hearts, as well as an understanding of what it is to live and die in God’s sight. 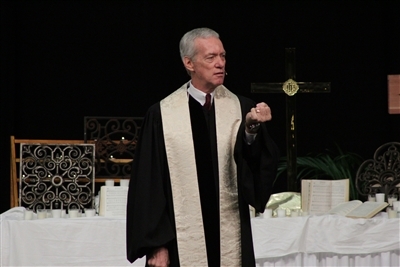 Roughton’s sermon centered on Jesus’ call for his followers to become servants. He drew from Mark 9:33-37, in which Jesus asks his disciples what they had been arguing about as they walked. “They had been arguing about who was the greatest but would not answer Jesus’ question… which was a sad moment for Jesus,” Roughton said. Rev. Phil Roughton remembers the faithful servants of the Florida Conference at a memorial service during Annual Conference 2013. Photo by Dave Walter. In contrast to these poor disciples and their failures, Roughton offered an example of Bishop Ed Garrison. In addition to being a voice for justice during the chaotic 1960s, Garrison had served in various jobs, including helping the inexperienced Roughton in his early role as a pastor. Roughton said that Jesus had offered Garrison a better way --to be a servant of all. “This morning we’re remembering and celebrating the lives of people who heard that very same offer, and like Bishop Garrison and so many others who have gone before, they said yes," he said.